The first recipe of the year should be special. Special in the sense that it should involve something I love to make, something that turned out particularly delicious, and that I will be making again and again as the year goes by. Two options fought hard in my mind to be featured. 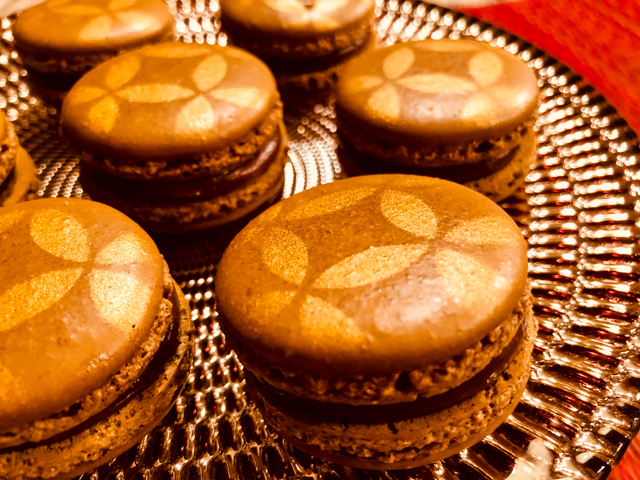 Mirror-glazed cakes, and French macarons. 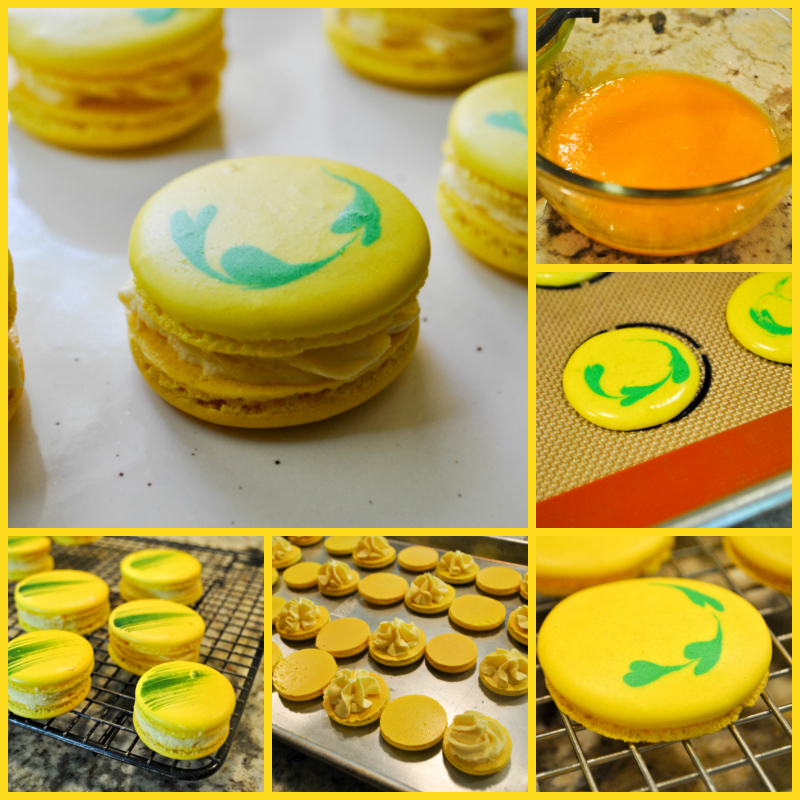 If you’ve been around the Bewitching, you know that my obsession with macarons is several years old. Mirror glaze is a more recent adventure, but not less fascinating for me. What made me go for macarons? 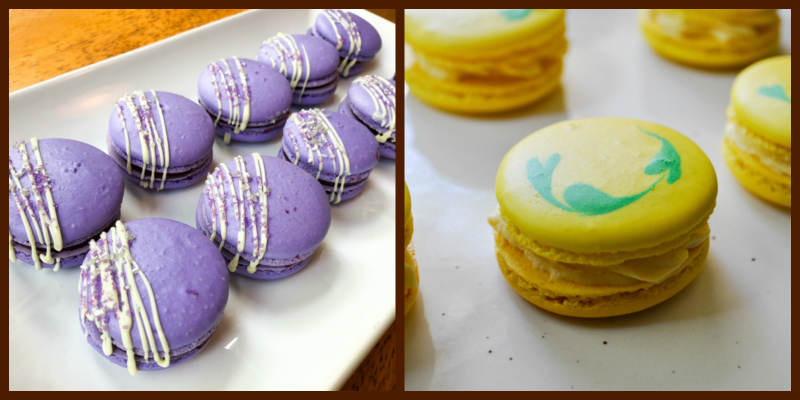 The fact that I have five macaron recipes not yet shared with you. Mirror-glaze cake? I only have one. 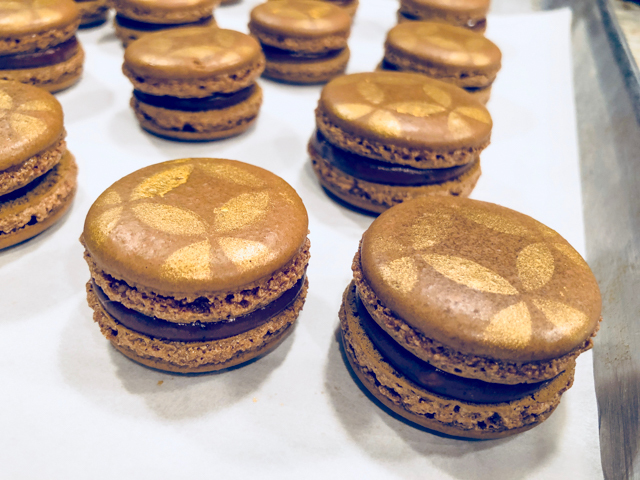 Another factor that tipped the scale was that my last macaron post happened last August, whereas shiny cakes were featured just a couple of weeks ago. So that pretty much settled it. 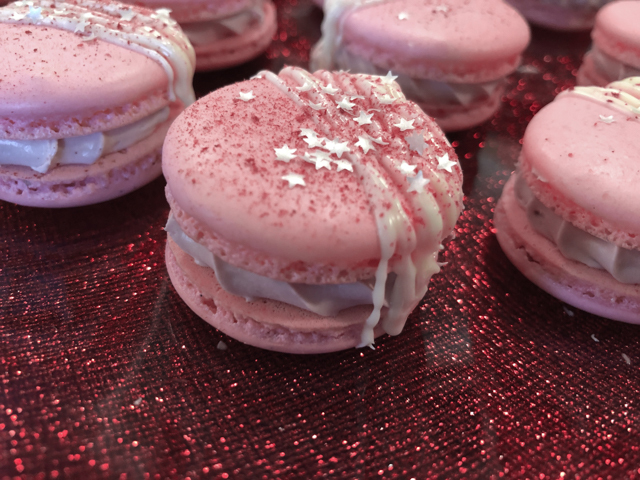 I made this batch of pink macs to give to dear friends, which also made them much more special to me. Slam each sheet hard four to six times on the counter. Then fist bump each end of the sheet’s underside twice. 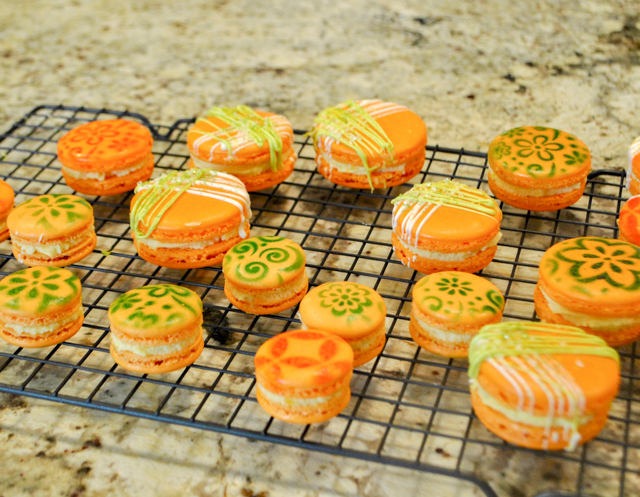 Let the unbaked macarons dry until they look dull but not overly dry. Drying time depends on humidity. 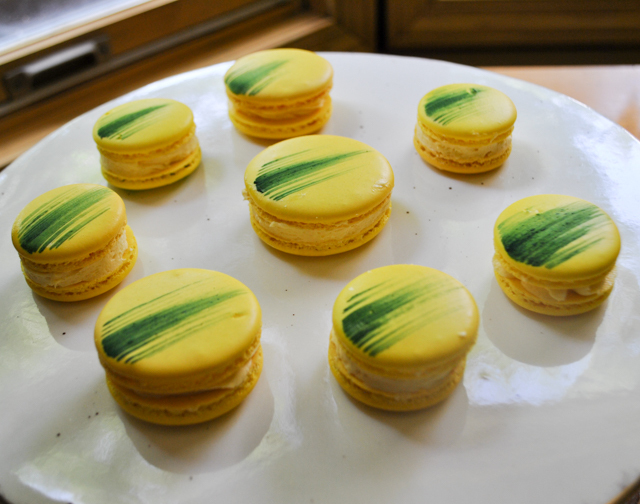 Ina dry climate, the macarons can dry in 15 to 20 minutes; in a humid climate, it can take 35 to 40 minutes. 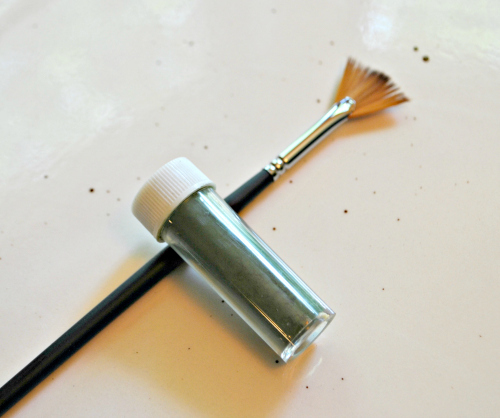 If using edible gold powder, sprinkle a little with a brush and use a hand-held fan to spread it over like dust. Assemble the macarons: find two macarons similar in size and pipe a good amount of filling to the bottom of one of them. Place the other on top and squeeze gently to take the filling all the way to the edge. Decorate any way you want, or leave them plain. Store in the fridge for 24 hours for perfect texture. Comments: I am very happy with this bake. I think the raspberry ganache worked very well as a filling, because the white chocolate is sweet, but the raspberry balances it all. I made this exact filling twice, first time I used raspberry jam with seeds, this time it was seedless. I liked them both, actually. Since seedless can be a bit harder to find, I advise you not to worry too much about it, either way it will be great. To get the raspberry dust, simply press a few freeze-dried raspberries through a small sieve on top of the chocolate drizzle before it sets. These little bits of powder pack intense sharp flavor and really pump up the raspberry component. Freeze-dried fruits last a long time, so I always make sure to keep a bag in the pantry. On the chocolate drizzle: you don’t have to temper the chocolate for that. It will not be as shiny as if you go through the trouble of tempering, but with all the other sprinkles on top, I don’t think it makes much difference. You can conceivably use Candy Melts, but their taste does not compare with the real thing. And for great friends, how could I not use the very best? Finally, I little comment about the pictures. The two initial photos were taken with my camera, all others with my cell phone. The difference in color is striking. Oddly enough, the cell phone depicted them more realistically as far as the shade of pink. I don’t know why that would be the case, it’s a bit frustrating, as I think overall the quality of the shots with a real camera is much better. Oh, well. If anyone has some input, drop me a line at sallybr2008 at gmail dot com. MERCI BIEN! SEVEN YEARS AGO: My First Award! Brazil meets France, big time. If I was talking soccer, that would be pretty unsettling, but since I mean macarons, it’s all good! 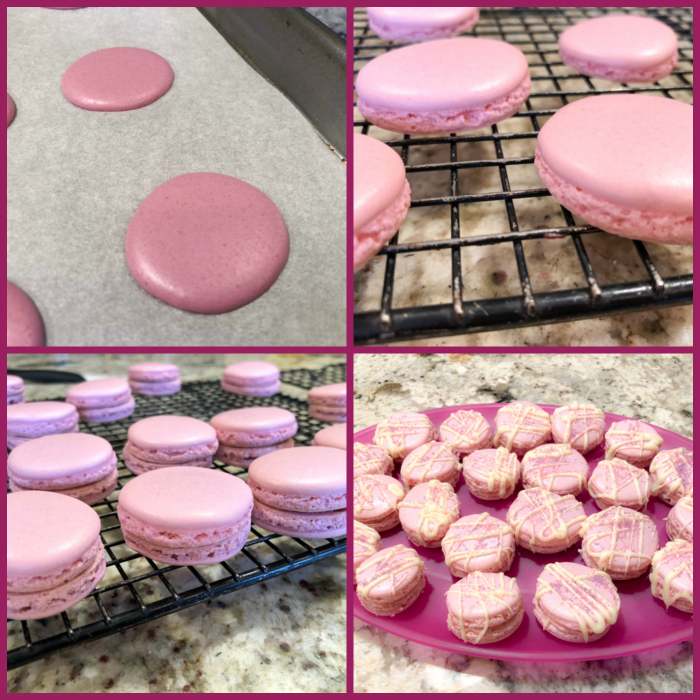 Macarons shells are considered overly sweet by many people, so a filling that balances that is my favorite option. Do not skimp on the lime zest, it is absolutely mandatory in this recipe. I put my air-brush to work, but in case you do not have one, a simple drizzle of white chocolate will do just fine. 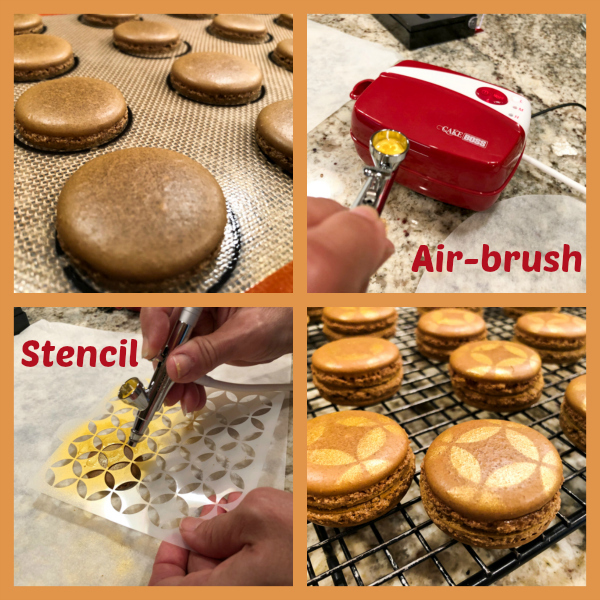 Decorate shells before filling using an air-brush and stencils, or if you prefer to decorate with a drizzle, do it after pairing and filling the macarons. For the mango white chocolate ganache, place the chocolate in a heat-resistant bowl. Bring the heavy cream to a to a simmer in a heavy-bottomed pot over medium heat. When bubbles start to form along the sides, remove from the heat and pour over the white chocolate. Allow to sit for a minute before stirring to combine. Whisk in the butter until completely melted. Stir in the mango puree and the lime zest until combined. Refrigerate overnight, or until set. Remove from the fridge and whip until slightly thickened, about 3-4 minutes. 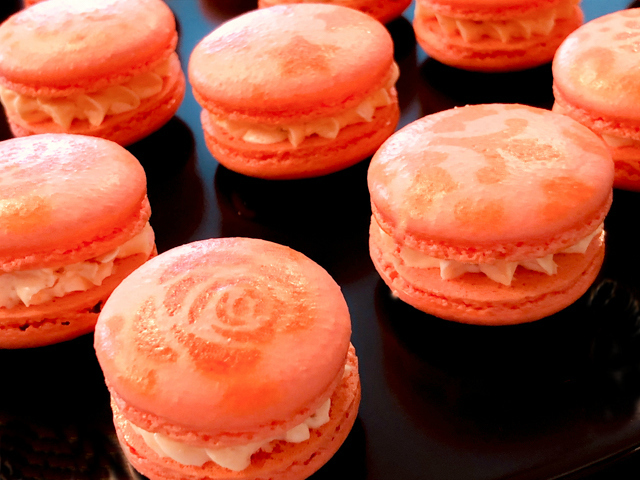 Pipe onto half of the macaron shells and then sandwich with a second shell. Allow to chill overnight so that macarons will mature and have a perfect consistency. Comments: I am quite smitten with my air-brush thingie… It takes just a little bit of getting used to, the main thing is to make sure you keep the spray 6 inches away or farther from the target. Otherwise the ink blotches and you don’t get the real nice effect of air-brushing. Obviously, this means it can be a bit messy, but the dyes wash out very easily. I just place a parchment paper under the shell I’m painting. 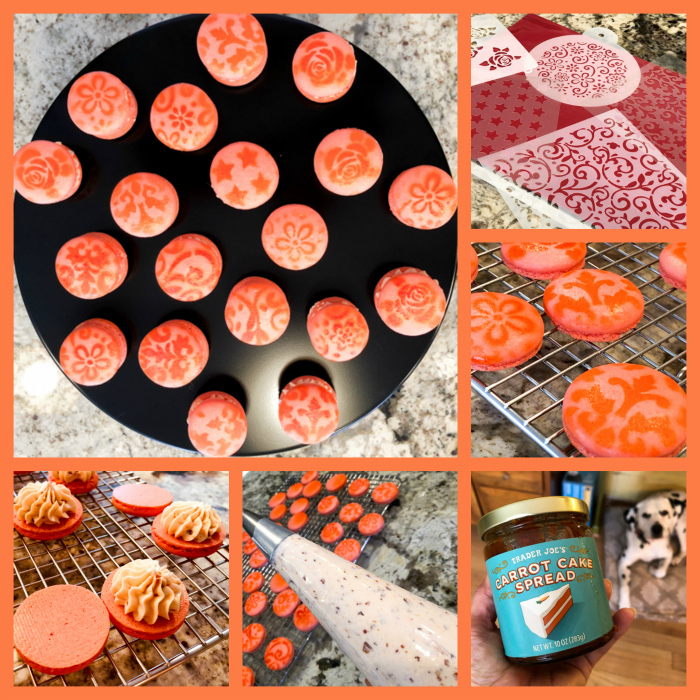 There is one super cool gadget to help with stenciling cookies, though. I will be featuring it on my next installment of In My Kitchen, in a few days. Don’t miss it. The filling for these macs was very tasty. The lime zest brightens it up, and counteracts the sweetness of the white chocolate ganache. I suppose I must add a new category to my blog. 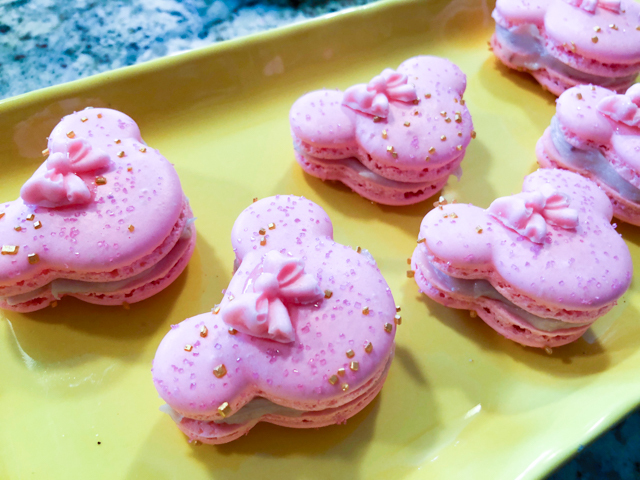 Macarons. Since I cannot fight my obsession, I shall embrace it. THREE YEARS AGO: How about some coffee with your steak? Make the pâte noisette. Start by placing water and sugar in a large saucepan. Heat up to 245 F. Then add the hazelnuts and almonds. Gradually, they will be covered with a white film. Cook until the sugar dissolves and caramelizes, stirring constantly. Be patient, it is going to take a little time. Pour the mixture on a sheet of parchment paper and let cool completely. Coarsely chop and add to a blender, the more powerful the better. In a Vitamix blender, in less than 5 minutes you should have a very smooth paste, which is what you want. Make the ganache. Heat the heavy cream almost to boiling point. Add to the chocolate, cut in pieces. Wait a couple of minutes and stir to completely dissolve the chocolate. Let it cool for half an hour, add the pâte praline made as described. Keep in the fridge for at least a couple of hours to get into spreadable consistency. Reserve to fill macarons. Make the shells. Place the egg whites and pinch of cream of tartar in the bowl of a stand mixer fitted with the whisk attachment. Make sure that the bowl and the whisk are impeccably clean. Starting on medium speed, whip the whites with the cream of tartar until they look like light foam. The whites should not appear liquid. The foam will be light and should not have any structure. Fold in the almond meal mixture in three increments. Paint the mixture halfway up the side of the bowl, using the flat side of a spatula. Scrape the mixture down to the center of the bowl. Repeat two or three times, then check to see if the mixture slides slowly down the side of the bowl. Put the mixture in a piping bag fitted with your tip of choice. Pipe on the prepared baking sheets. While the macarons are drying, heat the oven to 300 F. Bake one sheet at a time on the middle rack. Check in 12 minutes. If the tops slide, then bake for 2 to 3 more minutes. The macarons should release without sticking. Check one or two. If they stick, put them back in the oven for 1 to 2 more minutes. Let the macaroons cool for 10 minutes before removing from the pan. Use the air-brush and a stencil to decorate each shell. Pair them according to size and fill. Filled macarons should stay overnight in the fridge before consumed. The texture is much better on the following day. Comments: The air-brusher. I got it with a special discount from Groupon, after a tip from macaron-obsessed folks from a Facebook group. I am in love. First, it is pretty small and very easy to use. They advise you to practice on a piece of parchment paper, I did so, but realized it was pretty much a no-brainer. It has three speeds of spraying, I used the lowest, it gave good coverage without getting out of control. I mean, who wants to have a dalmatian with the ears sprayed gold? Second, it is super easy to clean. For me, that matters. Something that takes a lot of work to clean makes me think twice before using. This was a breeze. Warm water gets poured through the opening, sprayed inside a bowl with more warm water, done! You need special food color for the air-brusher, but I know it’s possible to improvise with normal dyes diluted in vodka or some other type of alcohol. I used Chefmaster. The filling. I suppose you can make a similar preparation using Nutella. But I tell you, making the pâte noisette from scratch and incorporating it in the ganache is a game-changer. It is nutty, almost smoky (it’s the caramel speaking), sweet but with a sharp twist to it. For my taste, it is close to perfection. I had a little bit of ganache noisette left. It was enjoyed one tiny teaspoon at a time, standing up by the fridge, while telling myself: make this again, roll as truffles, coat in chocolate sprinkles, give to all the special human beings in your life. Make your life sweeter, grab a pin! It all started with a very innocent email from my daughter-in-law. 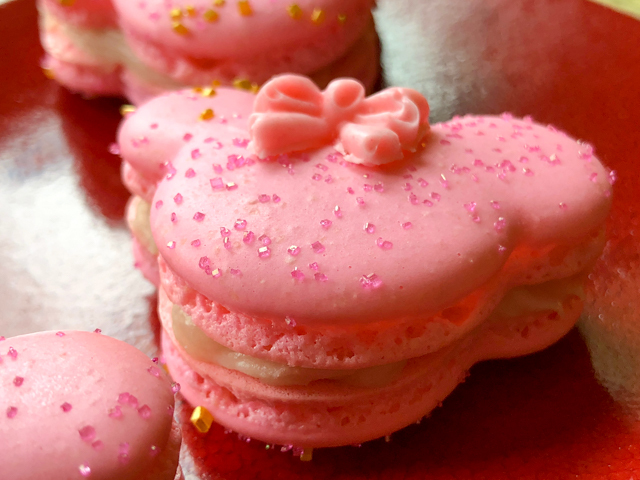 Inside a simple phrase and a single picture… The phrase: Something for you to try… The picture: a gorgeous Minnie Macaron sold at Disney. Miss G, our grand-daughter is crazy about all things Minnie. Basically, the universe conspired to make me bake a batch. Make the filling: Prepare fresh strawberry jam by mixing strawberries, sugar and lemon juice in a small saucepan. Cook for 30 minutes, mixing every once in a while. After 30 minutes cool and refrigerate. Reserve (you will not need the full amount). You can also use store-bough strawberry jam, if more convenient. Make a white chocolate ganache by mixing very hot heavy cream with the white chocolate cut into small pieces. Mix until fully dissolved. To that, add 1/4 cup of the strawberry jam prepared before, and the butter. Mix well and refrigerate until it’s time to fill the macarons. If too thick, bring to room temperature for an hour or so, whisking a few times. 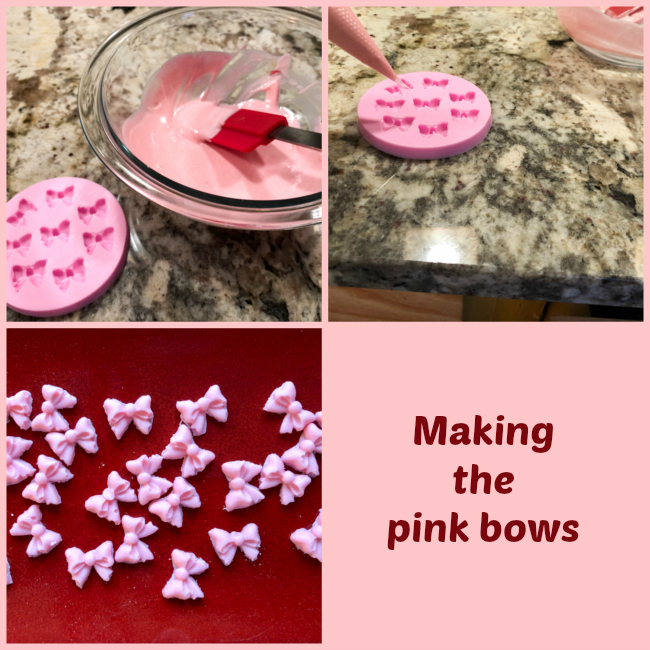 Make the pink bows: Melt about 1/3 cup candy melts in the microwave. Whisk until smooth, add a tiny drop of pink gel color. Place in a silicone mold and freeze until solid. Un-mold the decorations, make another batch until you have enough. 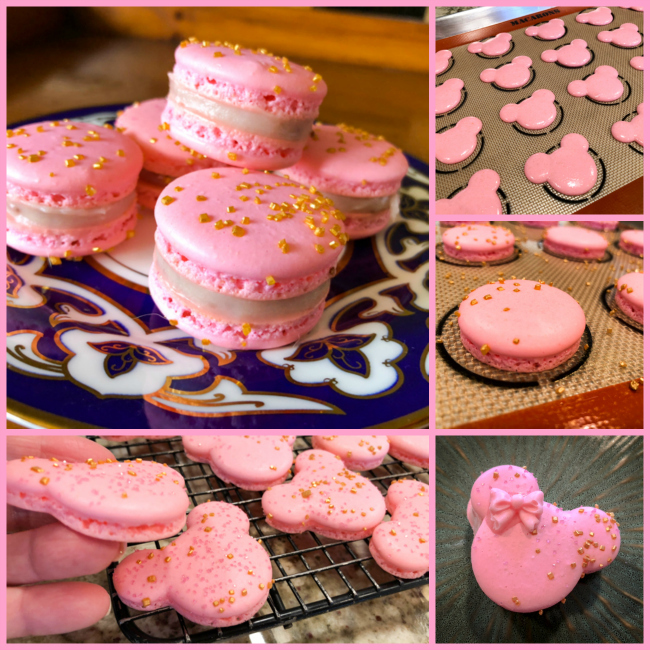 I made 14 Minnie macarons with this batch, and 16 regular round macarons that did not need the bow on top. Make the shells: Line 2 or 3 heavy baking sheets with parchment paper or Silpat mats. Layer the powdered sugar and almond meal in a food processor. Pulse until the mixture looks like fine meal, about 15 seconds. Pass through a sieve and transfer to a small bowl. Set aside. Place the egg whites and pinch of cream of tartar in the bowl of a stand mixer fitted with the whisk attachment. Make sure that the bowl and the whisk are impeccably clean. Starting on low-speed, whip the whites with the cream of tartar until they look like light foam. The whites should not appear liquid. The foam will be light and should not have any structure. Fold in the almond meal mixture in three increments. Paint the mixture halfway up the side of the bowl, using the flat side of a spatula. Scrape the mixture down to the center of the bowl. Repeat two or three times, then check to see if the mixture slides slowly down the side of the bowl. Divide the mixture (eyeballing is fine) in two piping bags, one fitted with a 1/2 inch piping tip, the other fitted with a 1/4 inch tip. Pipe macaron rounds using the bigger tip, filling one full tray. Pipe small rounds as ears on each round using the smaller tip. Finish one full tray before starting another one. Slam each sheet hard four to six times on the counter. Then fist bump each end of the sheet’s underside twice. 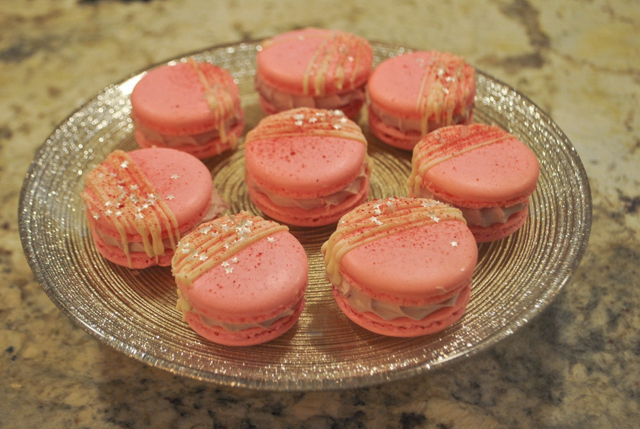 If using sparkling sugar, sprinkle over the macarons. Let the unbaked macarons dry until they look dull but not overly dry. Drying time depends on humidity. 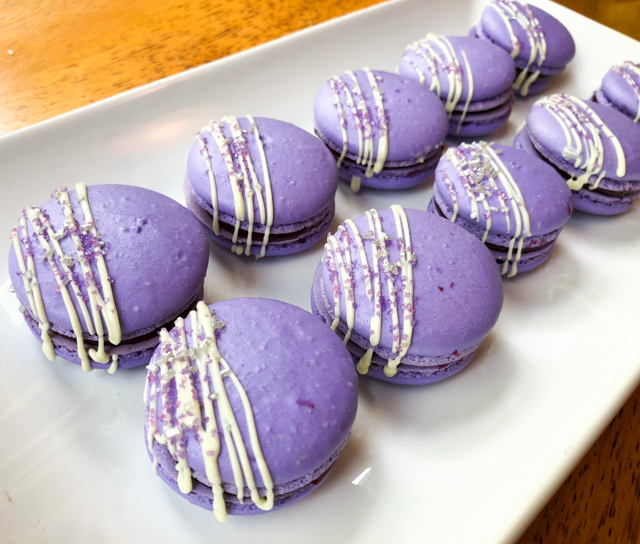 Ina dry climate, the macarons can dry in 15 to 20 minutes; in a humid climate, it can take 35 to 40 minutes. While the macarons are drying, heat the oven to 300 F (170 C/gas mark 3). Bake one sheet at a time on the middle rack. Check in 11 minutes. If the tops slide, then bake for 2 to 3 more minutes. The macarons should release without sticking. Check one or two. If they stick, put them back in the oven for 1 to 2 more minutes. Let the macaroons cool for 10 minutes before removing from the pan. 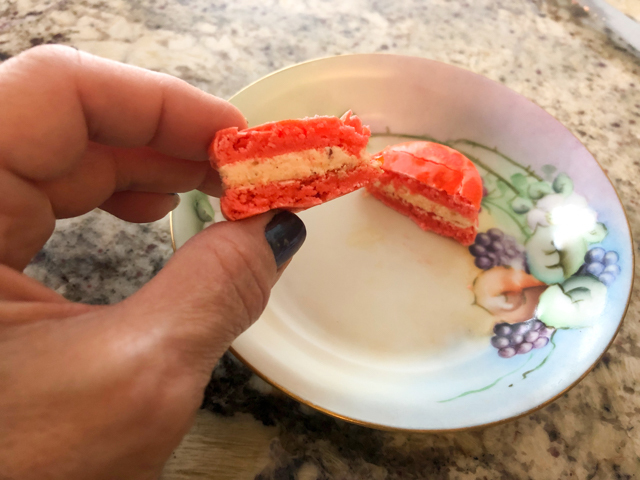 Assemble the macarons: find two macarons similar in size and add a good amount of filling to the bottom of one of them. Place the other on top and squeeze gently to take the filling all the way to the edge. 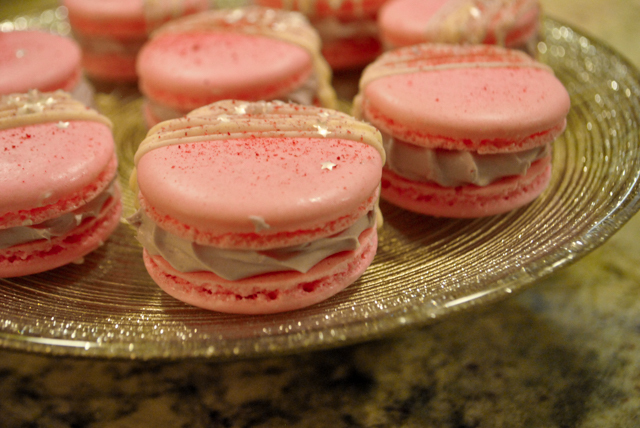 Glue to each macaron one little pink bow using melted white chocolate. Store in the fridge for 24 hours for perfect texture. I got a pretty cute silicone mold at amazon.com to make the bows. You can use fondant, real chocolate, or candy melts, whatever you prefer. I have a bit of fondant-phobia, and never worked with it, so Candy melts seemed like a safer option. Worked like a charm. The only problem is having to make several batches, but each needed only 10 minutes in the freezer to un-mold properly. I made the bows the day before and kept them all frozen in a little plastic bag. I know, so organized! Who could imagine that? 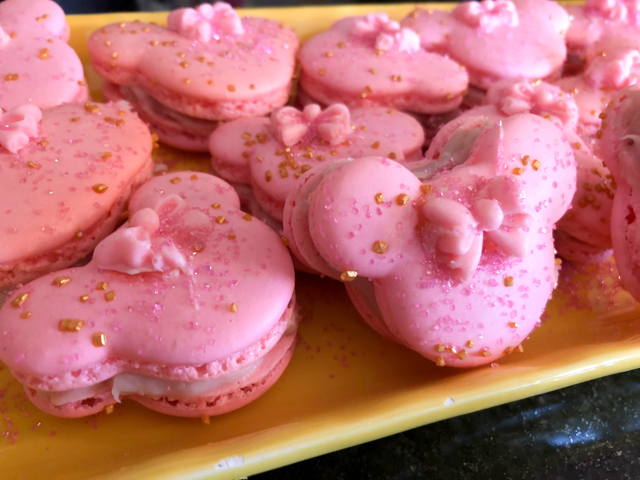 I made half the batch as regular macarons (large image of the composite photo above), and half Minnie-shaped. Those who are very skilled with a piping tip might be able to get by piping the ears with the same size tip as the face. I decided to play it safe, and poured some of the batter in a piping bag fitted with a smaller tip. For the body of the macaron I used a Wilton 2A tip, for the ears, a Wilton 12. With a more complex shape, it is important that the macaronage step be performed correctly. 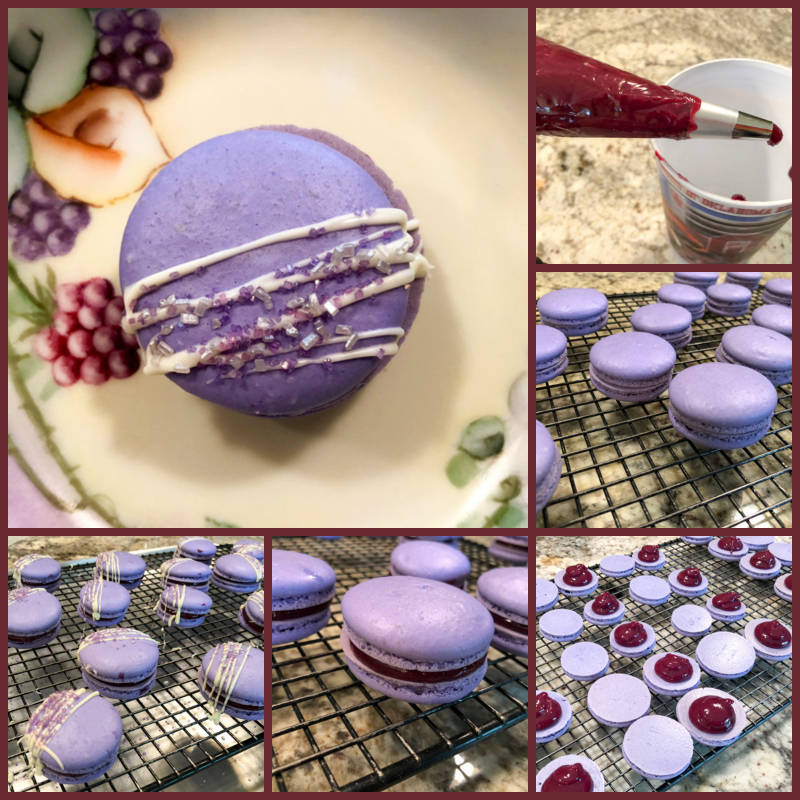 My tip for perfect macaronage: when I think I am almost at the right point of deflating the almond-meringue mixture, I get a teaspoon of batter and drop it on parchment paper. I lift the teaspoon, and the little blob that forms must disappear in about 20 seconds. If it does, the batter is ready, if it is still visible, I fold a few more times. Remember that you can always fold a few more times, but if you go overboard, the batter will be ruined. 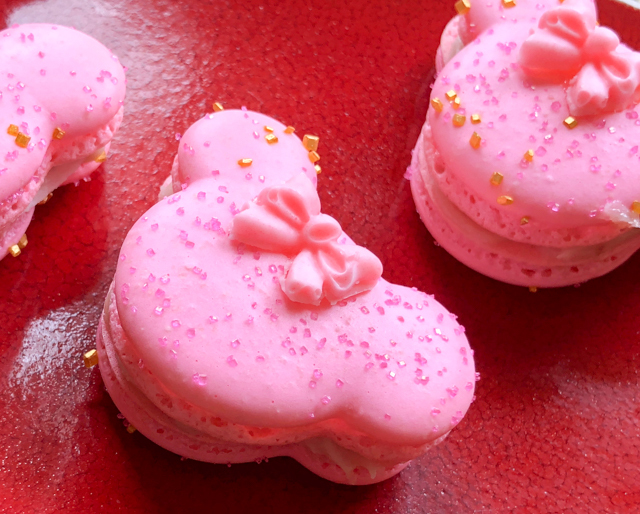 The macarons will spread too much, spread too thinly and it will be impossible to keep the Minnie shape as piped. Plus, they won’t form nice feet. At the very least you will need a box of Kleenex. If the situation persists, therapy might be your only option. I cannot tell you how happy I was with this project! 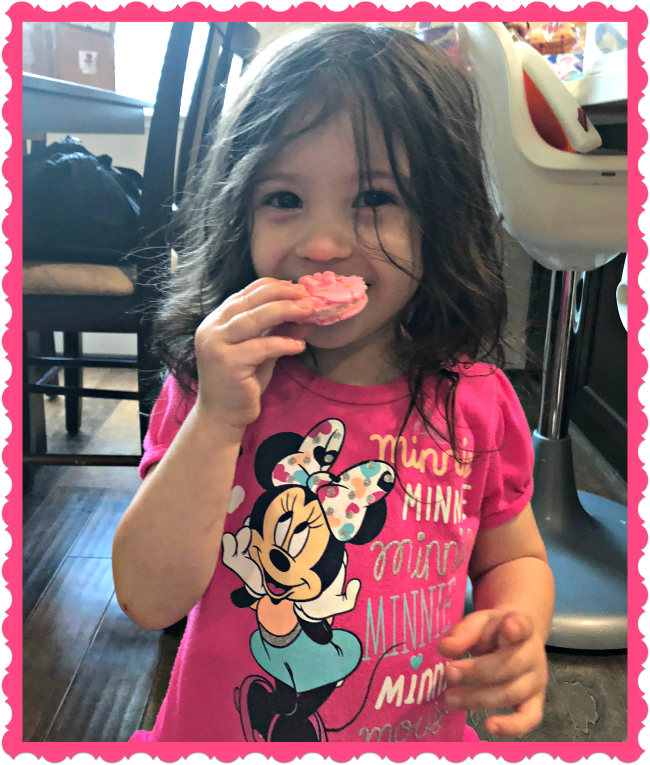 It was fun to plan, to get the tools for the job, to make it, and to imagine the look on Miss G’s face when she opened the box and found a bunch of Minnie cookies inside. The filling turned out just as I expected, sweet, but with the right amount of tartness given by the jam, which by the way, I made with a lot less sugar than store-bought versions. AND FOR THAT HAPPY ENDING…. It was not intentional, but once I was done decorating my babies, I realized they would have been perfect for Mardi Gras, or as we call in Brazil, Carnaval. 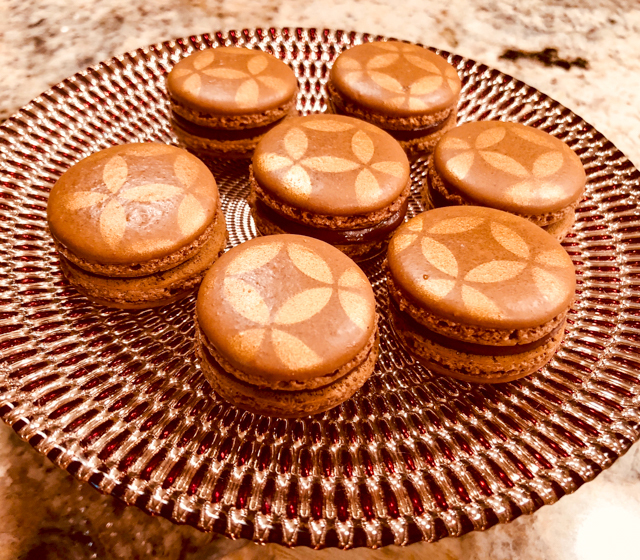 Made by the Italian meringue method, they were – full disclosure – the second batch baked in a single day, after a macaron fiasco I intend to completely forget. It involved cocoa powder and despair. Enough said. Undeterred, I cleaned up all the kitchen, sat down, took many breaths in, as many breaths out, looked in the mirror and said “You’ve got this.” Keep in mind the Winter Olympics were on, so I was contaminated by their unparalleled bravery. Did you watch those snowboarders in the half-pipe? 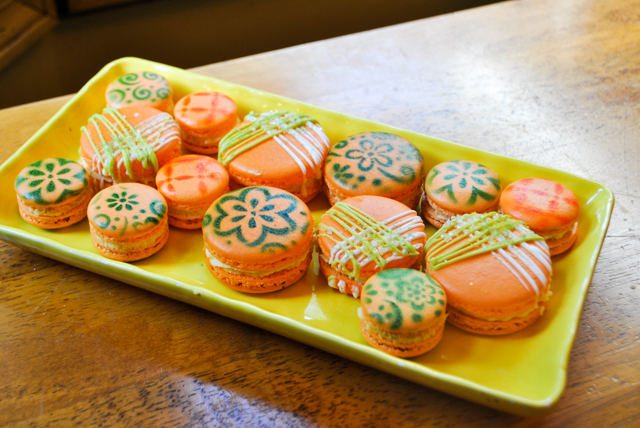 I mean, give me a batch or two of macarons to bake ANYTIME. Prepare the filling. Place chocolate cut in small pieces in a large Pyrex measuring cup. Heat the cream to almost boiling and pour over the chocolate. Let it sit for a couple of minutes, then gently stir. When totally dissolved, add the bergamot oil, then the raspberry preserves. Place in a food processor and pulse a few times to homogenize. If necessary, add a little more cream, but do not allow the mixture to be too liquid. Place in the fridge until needed. Make the shells. Heat the oven to 300 F. Line two baking sheets with Silpat or parchment paper, and prepare a pastry bag with a plain tip with 1/2 inch opening, or slightly smaller. Grind together the powdered sugar and almond powder, using a food processor, to obtain a fine powder. Sift through a sieve into large bowl. Mix the first portion (55g) egg whites with red food color, then add it to the sieved mixture of almond and sugar. It will form a paste, a bit thick. Try to incorporate the color homogeneously, keep in mind it will be lighter when you add the meringue to it. You want a light pink in the end. Make the Italian meringue. Place the other 55g egg whites and pinch of salt into the bowl of a Kitchen Aid type mixer. Set aside while you prepare the sugar syrup. In a small saucepan combine granulated sugar with water and place on medium heat. Using a candy thermometer measure syrup temperature. When it reaches 230 F start whipping the egg whites. When the syrup reaches 244 F pour it over the whipped egg whites while mixing continuously. Continue beating until the bowl has cooled slightly, and glossy peaks have formed. Add the whipped whites over the almonds mixture and using a rubber or silicone spatula gently fold in until combined and smooth. Make sure to “paint” the mixture on the walls of the bowl so that you get a smooth, lava-like consistency. Transfer the mixture to the piping bag fitted with a 1/2 inch (1 cm) plain tip. 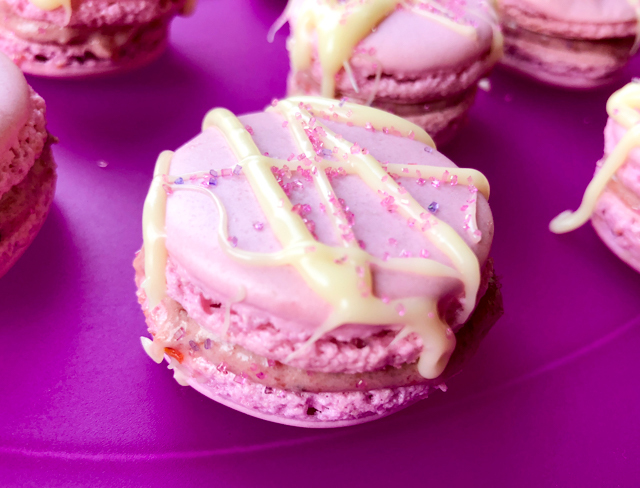 Pipe the batter to make macarons the size you like. 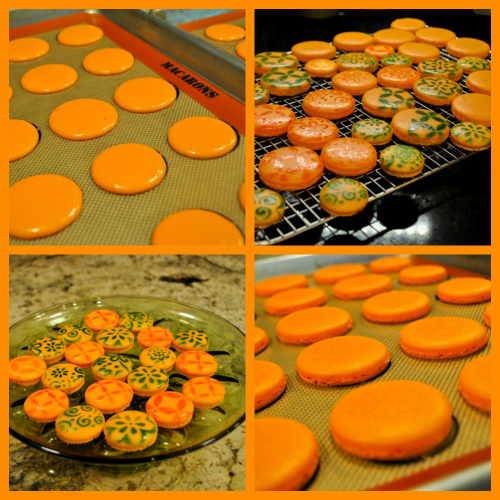 Rap the baking sheet a few times firmly on the counter top to flatten the macarons and to remove air bubbles. Let them sit at room temperature until a skin forms, about 30 minutes. Bake for 18 to 20 minutes. They are ready when the top doesn’t move freely when you hold them and twist gently. Let cool slightly before removing from baking sheet. Marry two by two of similar size, add the filling. Melt white chocolate and add to a small bag. 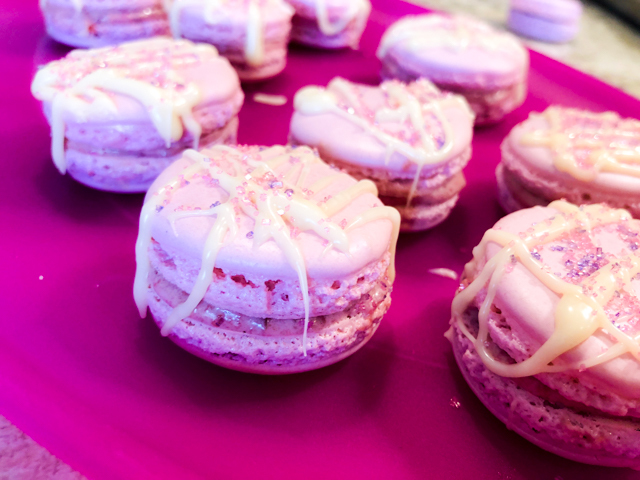 Cut a small opening with scissors and drizzle white chocolate on top of the filled macarons. White the chocolate is still warm, sprinkle the colored sugar on top. Place in the fridge overnight before serving them, at room temperature. If you do not have bergamot oil, use 1 teaspoon of freshly grated orange zest. I imagine a little bit of orange liquor could go well too, but you might have to play with amounts, as anything could get the delicate white chocolate ganache in trouble. 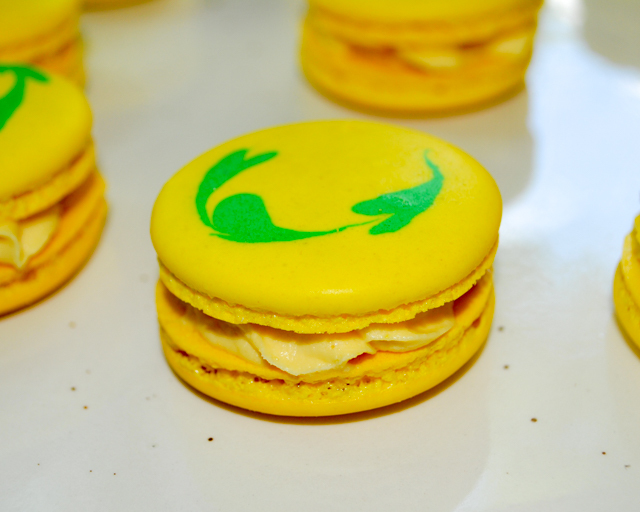 And you definitely want to stay away from trouble whenever macarons are involved. Make my day, grab a pin!